Liz Dexheimer’s paintings and works on paper have been exhibited widely throughout the northeast region and also in the southeast. Her work, including commissioned pieces, is in numerous private and corporate collections around the country, including the corporate headquarters of Frontier Communications, J.W. Marriott (Essex House), Hudson Insurance, Ritz Carlton and United Peoples Bank. 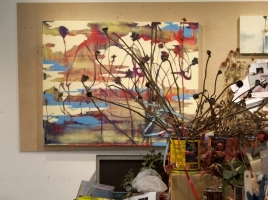 A native of Manhattan, Ms. Dexheimer currently resides in Washington, CT, where she maintains a painting studio. She creates her monotypes with the assistance of master printer Marina Ancona at 10 Grand Press in Brooklyn and in Santa Fe. She studied at Oberlin College, the School of Visual Arts and Parsons School of Design. She is a juried member of the Silvermine Artists Guild and is affiliated with several galleries in the eastern US.